Women always fight with the wrinkles on the face through various cosmetics. Many foods in our lifestyle can help us remove wrinkles. Rumour has it that certain foods can help you stay young. But when there are people who know exactly what to eat to fight back ageing, this is not just a rumour. Believe it or not, the type of food that you eat affects the overall quality of your skin. However, which foods remove wrinkles?. By eating the following foods, you can actually get rid of signs of ageing like wrinkles, fine lines, dark spots, etc. What’s On the Anti-Wrinkle Menu? One of the best foods to fix wrinkles would be cherries. Acerola cherry is also known as the Barbados cherry contains 1,000mg of vitamin C compared to oranges which have about 50 mg. And to keep your skin healthy and tighter, you need to have vitamin C which produces collagen. When you expose yourself under the sun, and when you are exposed to pollution, chemicals, cosmetics, etc., it weakens the collagen which in turn causes wrinkles. Apart from making your skin youthful, it also neutralises and protects your skin from free radicals. In addition to vitamin C, it contains vitamin a, riboflavin, niacin and thiamin. Niacin, riboflavin and thiamin help repair damaged cells. Take time to buy fresh cherries and include them in your meals. Pumpkin seeds can also prevent wrinkles. Rich in vitamin E, pumpkin seeds help in collagen formation which makes your skin look youthful and firmer. It also helps in protecting the skin from free radicals and at the same time, restore damaged skin cells. Pumpkin has alpha hydroxyl acids to help make your skin look more rejuvenated. It also contains beta-carotenoids which give moisture to your skin. Having a well-hydrated skin reduces your risk of getting wrinkles on your face. To remove wrinkles on your face, you need sodium hyaluronate and fatty acids found in pumpkin seeds. Few would know that broccoli can also help remove wrinkles. For a cup of broccoli, you can get 100% vitamin C. This specific vitamin is essential for producing collagen which makes your skin look more elastic. Apart from collage production, broccoli is also rich in beta-carotene. Vitamin A helps replace old skin cells. In turn, this will help you have renewed skin cells. No wonder broccoli is dubbed as one of the best anti-ageing foods that you can try as it can answer skin ageing problems like wrinkles, age spots, fine lines and a whole lot more. So make sure you use broccoli in your favourite dishes. You can get a lot of health benefits from eating broccoli. Sweet potatoes are considered to be one of the healthiest foods. It prevents diabetes, but it can also help you remove wrinkles. Sweet potatoes are loaded with glutathione which acts as an antioxidant that enhances your metabolism as well as your immune system. Since it contains vitamin C, it can also smooth out wrinkles. If you eat sweet potatoes, you can stimulate collagen production which is responsible for your skin’s elasticity. Based on studies, if you consume 4 mg of small sweet potato per day for three years, you can lessen the appearance of wrinkles by about 11%. For youthful complexion, blueberries are proven effective to reduce the signs of ageing. According to the United States Department of Agriculture, blueberries are loaded with vitamin C. It contains more antioxidant compared to strawberries. By eating blueberries, you can have stronger collagen formation. These delicious berries can also have other benefits like it can improve your eyesight and even your blood circulation. Another tremendous anti-wrinkle food is the tomato. This food is considered to be the best that can help you fight off wrinkles. Whether you believe it or not, these red tomatoes can offer a lot of wonders for your skin. Tomatoes are rich in Lycopene which can help you protect your skin from the harmful rays of the sun. Lycopene also acts as an antioxidant. When you are exposed to free radicals like smoking, pollution, etc., you may start to have wrinkles, dark spots, fine lines and other ageing problems. But when you like eating tomatoes, you can protect your skin from the sunburn and at the same time, you can also get smoother skin. Prepare meals with lots of tomatoes in it. For sure, you no longer have to worry whenever you have to go out under the sun. Instead of spending on expensive anti ageing treatments, you can actually have these foods as part of your skincare regimen. 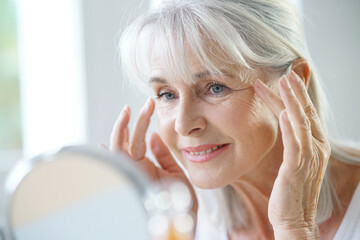 Not only do they make your skin look healthy, but they can also remove wrinkles and other skin ageing related problems. Since they are readily available in the market, you can easily include any of the mentioned foods above when you prepare meals. By taking these recommended foods for slowing down aging, you can have firmer and a more youthful looking skin.